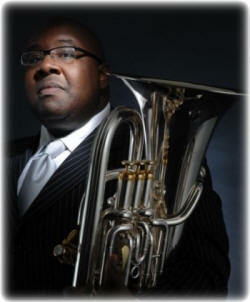 Feb. 19, 2010 -- Acclaimed trombone performer Demondrae Thurman will perform in the fourteenth event of Arkansas State University’s Lecture-Concert Series. He will present “Demondrae Thurman on Euphonium and Tuba” on Tuesday, March 16, at 7:30 p.m. in Riceland Hall, Fowler Center, 201 Olympic Drive, Jonesboro. Thurman, a native of Tuscaloosa, Ala., studied euphonium, trombone, and conducting at the University of Alabama and the University of Wisconsin-Madison. This performance is co-sponsored by the Office of Diversity at ASU, and the event is free and open to the public. At the University of Alabama, he become the first undergraduate ever to perform solo with the Alabama Wind Ensemble under the direction of Dr. Gerald Welker. Performing with the same ensemble in 1995, Thurman also premiered Dr. Frederic Goosen’s “Sinfonia Concertante.” During his time in Madison, he was a soloist with the symphony orchestra, wind ensemble, and several high school bands in the area. Thurman is a founding member of Sotto Voce Tuba Quartet, a tuba quartet that won both international tuba quartet competitions in 1998. They have also released three records through Summit records. In 2004, Sotto Voce performed at the International Tuba/Euphonium Conference in Budapest, Hungary. The quartet has also played for the U.S. Army Band Conference in addition to touring at many different universities and colleges in the country. Thurman has also performed works for solo euphonium including “Soliloquies” by John Stevens and “Fantasy for Euphonium and Orchestra” by Doug Bristol. Thurman has performed with Motown recording artists such as The Temptations, The Four Tops and The Supremes. He plays the first baritone horn with Brass Band of Battle Creek, as well as performing with the Mobile Symphony, the Jacksonville Symphony, the Tuscaloosa Symphony, and the Hot Springs Festival Orchestra. A solo recording endeavor, “Soliloquies,” was released in 2005 on Summit Records. Watch and listen to Thurman perform online. Thurman is currently an associate professor of tuba and euphonium at the University of Alabama, as well as chair of Brass at the university. Prior to that teaching position at University of Alabama, he taught at Alabama State University, the University of Montevallo, and Troy State University. For more details, contact Dr. Gil Fowler, associate dean for the Honors College, at (870) 972-2308.The Lecture-Concert Series presents diverse programs to enrich the cultural life of the campus, community, and region. --Molly Carpenter, senior public relations student intern, wrote, designed, and distributed this release and posted it online.